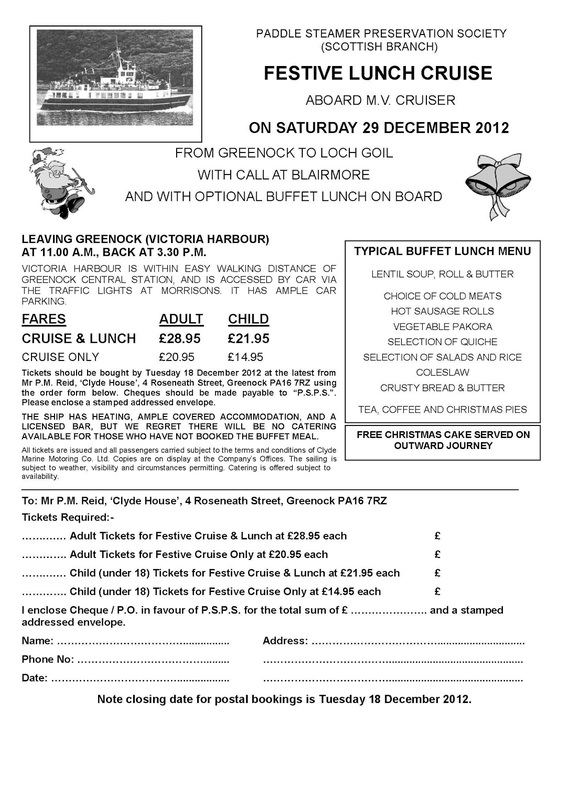 The annual Festive Lunch Cruise will take place on Saturday 29th December aboard M.V. Cruiser from Greenock to Loch Goil. Cruiser will depart from Victoria Harbour Greenock at 11am and return at 3.30pm, she will call at Blairmore for a brief visit ashore before sailing up Loch Long and into Loch Goil. 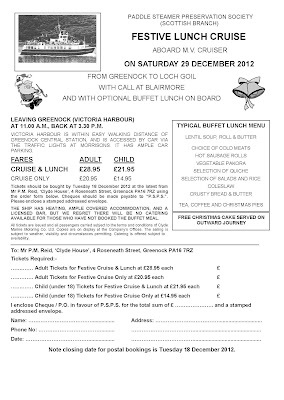 Tickets are now on sale and can be purchased using the booking form sent out with the autumn edition of Paddle Wheels. Non-members are very welcome and can purchase tickets by downloading the booking form below. Tickets should be ordered by post before 18th December but will also be available at the next Branch meeting on Friday 14th December subject to availability. The Branch meeting on Friday 14th December is the annual joint meeting with the West Highland Steamer Club when Iain Quinn presents "In the Wake of the Comet-A Glance at the British Paddle Steamers". The meeting begins at 7.30pm in the Renfield St. Stephen's Church Centre, Bath Street, Glasgow.